The COMBI® welfare unitis unique to Rawley Plant. 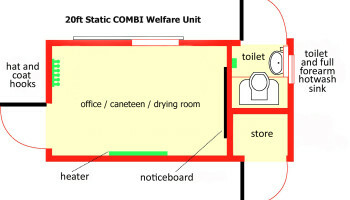 The COMBI® welfare unit combines a portable chemical toilet inside an anti-vandal site welfare cabin. It also provides a small secure storage space for tools and other equipment. The COMBI® welfare unit is most suitable for sites where a mains or generator power supply is available. This unit can be hired as an office and toilet, a canteen and toilet or a drying room and toilet. We also have a store and toilet option. Choose from the sizes below or contact us to discuss your options. 16ft mobile welfare unit - office / canteen / drying room. 16ft static welfare unit - office / canteen / drying room. 24ft static welfare unit - office and canteen / drying room. 20ft static welfare unit - office / canteen / drying room. 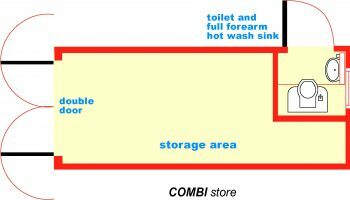 20ft static COMBI store with integral toilet.